In 1886 German chemist Clemens Winkler discovered a new atomic element. Situated on the periodic table one level directly below silicon and named after the country of his birth, germanium would come to be widely used in the manufacture of the fiber optic cables that are now an essential part of our global information networks.1 Nearly a hundred years later, Friedrich Kittler wrote about these fiber optic networks as part of his larger project to study media by focusing on the material and technical aspects of their operation – a body of work forming the cornerstone of the materialist approach now widely referred to as German media theory. More recently still, Jussi Parikka outlines the potentials of a “more geologically-oriented notion of depth of media,” and an “excavation into the mineral and raw material basis of technological development,” citing germanium as one of several elements that could be studied in a “materiality of information technology [starting] from the soil.”2 We might thus trace this material, germanium, through a history of ideas beginning with new communication technologies enabled by 19th century scientific development and ending with a focus on the underlying material properties that make these technologies possible. While germanium itself was an important discovery, it had been predicted nearly a decade before Winkler by another chemist, Dimitry Mendeleev. Consider another historical moment which, when introduced here, puts a slight wrinkle in the above tidy trajectory. While germanium itself was an important discovery, its truly remarkable role in the history of science comes from the fact that it had been predicted nearly a decade before Winkler by another chemist, Dimitry Mendeleev. In being proven to exist almost precisely as Mendeleev predicted, germanium confirmed his hypothesis of the “periodicity” of atomic elements, and cemented the periodic table as an essential organizing principle and epistemological device.3 Winkler very literally filled in a blank, drawn by Mendeleev, in a Foucauldian tabula, which in this case was the periodic table itself. In other words, even at this very “elemental” level, where we might look to find some material bedrock upon which to construct an archaeological media theory, we find still lower levels: observable phenomena determined by combinations of subatomic particles, and the epistemological tools that we use to predict, discuss, and conceptualize them. After all, isn’t every discovery itself also an invention? It is the invention of a name – the practice of turning a thing into an object that we can talk about and situate among other objects. Every discourse network is itself still a discursive formation. Perhaps nowhere is this more poignantly illustrated than in the case of computer software. 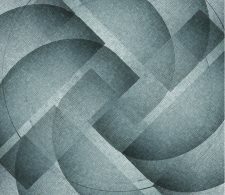 Within the much-discussed methodology of “object-oriented programming,” a programmer literally describes some worldly thing as an object within some system of other objects – giving it a name and attributes, enabling it to be related to other objects and operated on by the computer program.4 This essay focuses on software and software-based network technology in order to examine and expand on what it means to do network archaeology. By introducing a software structure known as the stack, I will demonstrate how software is particularly appropriate for an archaeological analysis, but caution that, in the process, we must be careful about conceptualizing these systems as existing beyond the reach of interpretive cultural analysis. An archaeological analysis of the stack illustrates how such software systems are always intensely striated and highly hierarchical, comprised of layers that provide fertile ground for archaeological digging – but at the same time it problematizes the materialist approach, as it reveals how each layer of software systems are always constructed “above” some lower level. In an essay titled “Media Archaeography,” Wolfgang Ernst writes that media archaeology is “primarily interested in the nondiscursive infrastructure and (hidden) programs of media.”5 This characterization prompts a more formal articulation of the questions introduced above: is it possible to access and identify aspects of media that can truly be considered “nondiscursive”? And to the extent that such an operation is possible, precisely where and how are we to locate such aspects? Ernst goes on to say that “media are not only objects but also subjects of media archaeology,” referring to a kind of non-human agency seen as embedded within certain technical media, particularly software.6 In the context of the present discussion – whether it is truly possible to access nondiscursive layers of media, and what that even might mean – it will be productive to explore how it is that software-based media can be conceptualized as subjects. The IF-THEN was first explored in machine form by Charles Babbage – the 19th century inventor now well known for designing two “engines” that have come to be seen as mechanical precursors to our current digital information technology.9 The first, the Difference Engine, was essentially a complex adding machine designed to exhaustively run the same operation on many inputs, generating large tables that scientists and engineers could use to lookup the value of a needed calculation. The machine was never successfully constructed during his lifetime, but after completing plans for it, Babbage began to think more generally about how to create a more powerful machine that could essentially be programmed to solve a wider range of problems. Babbage never managed to complete the design for what came to be called the Analytical Engine, but from what we know, it would have had some facility similar to IF-THEN conditional branching. Babbage’s work seems to lend credence to the idea, as Babbage must have come to believe, that in order to move from a fixed, pre-programmed machine to a generalized, programmable one, something like a conditional IF-THEN would be an invaluable component. Indeed, Kittler’s argument for the primacy of the IF-THEN is a compelling one. If we conceptualize conditional branching as he argues – as somehow essential to a machine subject – this enables us to understand the IF-THEN in a way that satisfies Ernst: as a kind of naturalized or essential precondition of any computational media, or in other words, a nondiscursive structure that exists outside of or before the technical object. But does this understanding of conditional branching make sense? In response to this question, consider a somewhat speculative counter-example: the simple mouse trap. Like Babbage’s engines, the basic spring-loaded mouse trap was a product of the 19th century mechanical era – a patent for it was granted several decades after Babbage first conceived of the Analytical Engine.10 In a way, we can see this as the most basic mechanical IF-THEN device. The “programmer” sets up the machine, effectively programming a simple algorithm: if the mouse touches the bait, then close the trap.11 While we would not consider this a true programmable system, the point is that a simple, mechanical circuit between some input and an IF-THEN response does not necessarily create a system that could be thought of as a machine subject. And so, if the IF-THEN is not the necessary and sufficient condition of a machine subject, is it possible to identify some other structure that is? In the 1930s Alan Turing famously formalized his Universal Turing Machine. Using this notion of conditional branching along other concepts from mathematics, logic and set theory, Turing created an abstract model of a calculating machine which he formally proved could compute any process that any other machine could – a theoretical machine that was in fact “universal.”12 This formal proof is known as the Church-Turing Thesis. The other name here refers to Alonzo Church, who had, independently of Turing, devised his own theoretical machine model that he called the Lambda Calculus. In proving this notion of universality, it was also proven that these two fundamentally different models of computation were equivalent – which is to say, they were equally powerful. 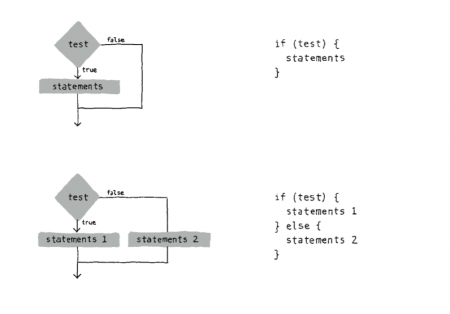 One key difference though between the two models is that the Lambda Calculus does not have an explicit notion of the IF-THEN conditional branch. Instead, Church’s model is based purely on the ability to define functions (subroutines) and for these functions to be able to call each other in an arbitrarily nested or recursive way. As it turns out, this capacity for a computational process to be composed of definable functions that are able to call each other is sufficient: using only this it is possible to implement conditional branching. It is possible to demonstrate this principle using many functional programming languages – for example LISP, which was designed around principles from the Lambda Calculus.13 So in one sense, we can see a kind of a priori even to the IF-THEN. Media archaeology is often said to be interested in “prehistories,” and in the aforementioned essay, Ernst implores us to understand this not as temporally prior, but rather as technical precondition.14 The Lambda Calculus satisfies each of these aspects: it can be understood as both technically prior and temporally prior, as Church published on the topic slightly before Turing published on his universal machine. However, the present goal is not to argue about which of these models is somehow more essential to computational media. Rather, the purpose is to challenge the primacy of a concept assumed to be inherent to computation itself, revealing that even something as basic as a logical IF-THEN can be seen as constructed within some discursive framework and reducible to some other lower level phenomenon. Additionally, it is productive to explore what can be learned about software and symbolic computation by provisionally considering this other structure as a possible fundamental building block. Within actual programming languages (and within the underlying machine hardware on which such programming languages are implemented), the recursively callable functions as described by the Lambda Calculus are implemented using what is known as the function call stack. Using this structure, the computer stores the state of the current function being evaluated, and if that function calls another function, it will “push” everything down and repeat, so that when the latter function returns, it will “pop” off the top and return back to the prior function. Figure 2 illustrates an example of this behavior. Imagine a program that was drawing a square on the screen. The algorithm for this might be to implement a subroutine to draw a line, and then to call that subroutine four times. 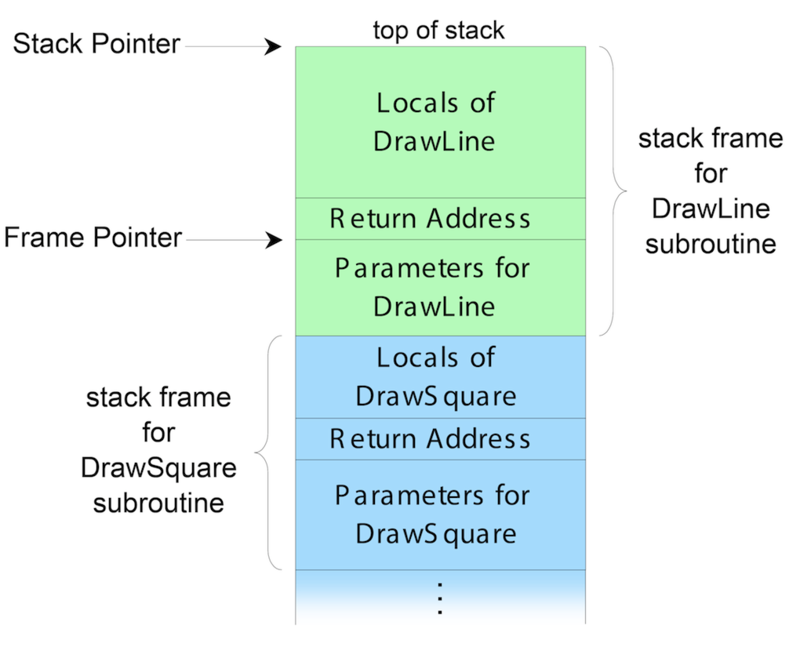 The diagram shows a snapshot of the stack when the DrawSquare subroutine has just called the DrawLine subroutine. If DrawLine now called something else in turn, everything would be pushed down again. A key concept illustrated here is the way in which computational processes are always composed of multiple frames of reference, or abstraction layers. The stack shows how these are managed within the machine. The direction of the stack’s vertical order is not important (on some systems the stack “grows up,” as here; on other systems it “grows down”). But the stack shows how “higher level” functions (in this case DrawSquare) persist over a duration in which many “lower level” functions may execute and complete.15 An important guiding principle about this type of abstraction within the field of computer science is that higher level functions be designed in a way that is agnostic about the implementation details of lower levels. So in the present example, if the DrawLine function were modified in some way (perhaps to draw two shorter lines attached at a slight angle) then the DrawSquare function should still operate without any other modifications (but would then in this case create a kind of octagon shape instead of a simple square). This function call stack is illustrated with a concrete example in Figure 3. The chart pictured here is a visualization of the execution of an actual computer program – in this case a popular open source content management system (a web tool that allows non-technical users to manage complex websites) although the same principles apply to nearly any program.17 The computational task illustrated here is the generation of one webpage within this system. 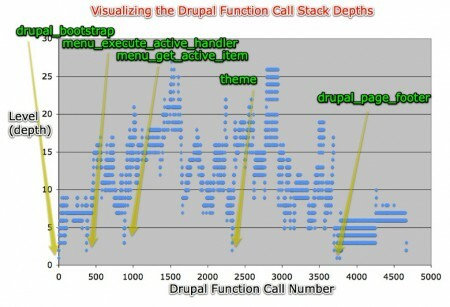 This visualization was generated using Xdebug: a diagnostic tool for the PHP programming language that, among other things, can actually record every function call of a program during some timeframe and export that data to be plotted in a separate charting tool.18 On the lower left of the chart is the first function that gets called. Time is on the horizontal axis and advances to the right, and every vertical uptick is a nested function call. The graph illustrates the way in which the size of the call stack increases and decreases as functions call other functions and then return themselves. This graphic shows that there are approximately 5000 function calls total, and in practice this would probably take a few tenths of a second.19 Visualized in this way, the stack demonstrates the manner in which various abstraction levels operate at vastly different and nearly incompatible time scales: a real world example of the concept of micro-temporalities, discussed elsewhere in this issue. Higher level functions may be responding to user input or creating an animation visible to the human eye, while lower level functions carry out inhuman amounts of computation in miniscule intervals. In addition to the function call stack, within the field of computer science, the basic principles of the stack have been generalized into structures that are studied in and of themselves. 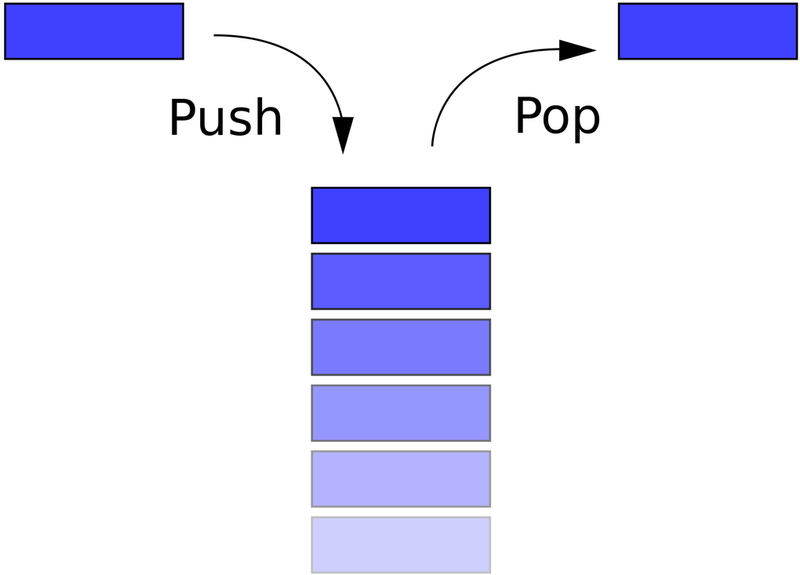 Perhaps most fundamentally, the stack is studied as a construct known as a data structure: a kind of generic schema or diagram for storing data in a way that is useful in many different contexts and for many different algorithms.21 The main operations on a stack are known as push and pop, and the primary feature of a stack is what is known as “last in, first out”: the most recent item to have been added is the first that gets removed. This set of operations is essential to the archaeological approach. Archaeology proper takes the earth as its stack – newer objects are closer to the surface, and the archaeologist digs deeper to access and excavate prior historical periods – and in media archaeology we begin with our present techno-media circumstance and look for forgotten precedents, alternative histories, etc. Even beyond these purely technical examples, the stack pops up in many other contexts. Stack-like structures are used to conceptualize technological systems in numerous ways. Figure 5 shows several of these. 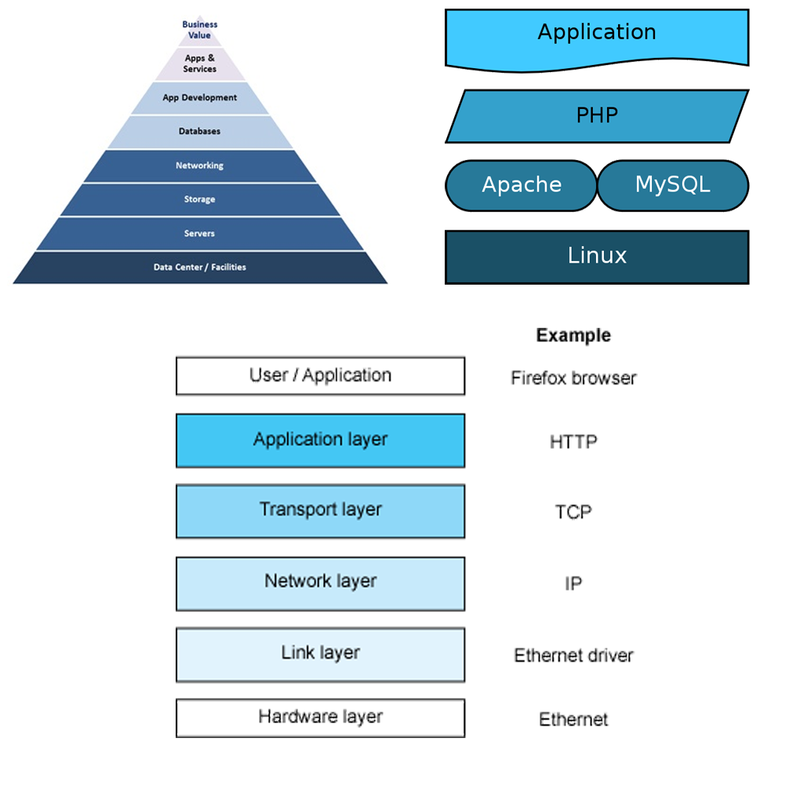 The first is a general diagram revealing the architecture of some software application – often called an “application stack.” This type of illustration is widely used to explain the pieces of a complex software system to a non-technical audience. 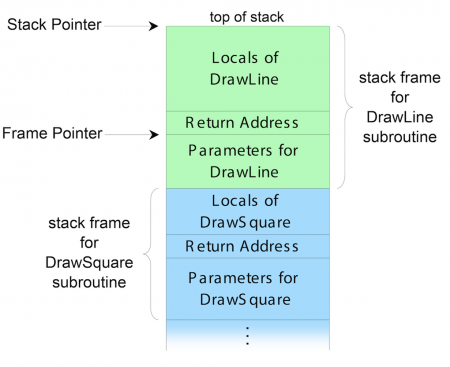 While this type of stack is technically different from the function call stack introduced above, both diagrams embody a similar approach to representing the recursively nested abstraction layers of technical systems. At the top of the diagram are always terms like “value,” “business,” “users,” etc. ; and at the bottom are terms standing in for “low level” infrastructure such as “hardware,” “electricity,” and so on. It is in this sense that the stack or stack-like concepts are perhaps most commonly referenced in media theory; for example, in Expressive Processing, Noah Wardrip-Fruin refers to “the common metaphoric presentation of computing as a tower of abstractions – computing platform, software, and display/interface” which, essentially, is another way of describing the application stack as represented here.23 The next diagram is one particular application stack that is widely used today, comprised of all open source technologies and known as the LAMP stack. At the bottom we see Linux, an operating system; then Apache and MySQL, a database and webserver; next is PHP, the programming language; and finally, the application itself, seen to sit “on top” of all these other systems. The last diagram is an example of the network stack, often referred to as the “OSI model.”24 This stack is ubiquitous within discussions of information technology networks, and is mentioned by Alexander Galloway in Protocol: How Control Exists after Decentralization, where, appropriating a concept from Marshall McLuhan, he writes that “the content of every new protocol is always another protocol.”25 The stack provides a new perspective on this concept of protocol nesting, and we can see the stack itself as a generalization of this concept from the network context. 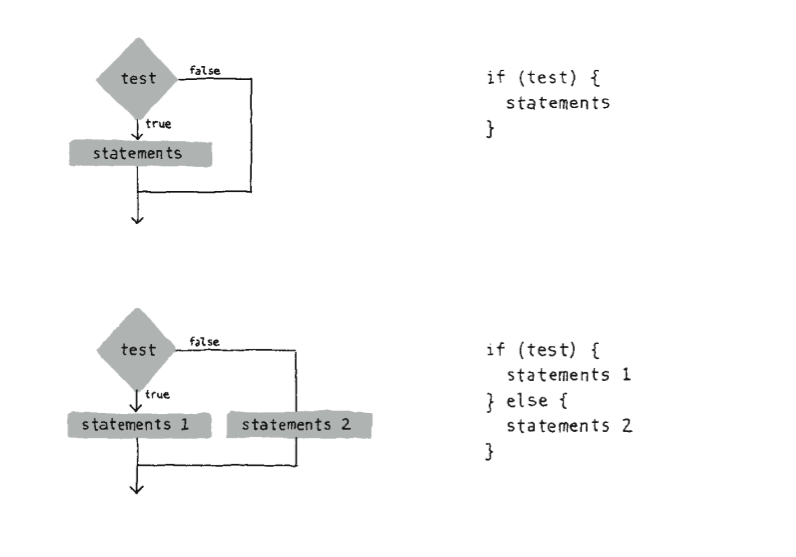 Here, I admit that I am conceptually conflating the stack as an operative structure that exists materially within the program code of software systems, and the stack as a class of diagrams used to explain both these operative structures and software systems more generally. By purposefully blurring the distinction between them, I aim to speak about both of these aspects simultaneously and generate new conceptual insights from their mutual interpenetration. On one hand, the operative stack always exists in time, within a functioning machine, implying that the diagrammatic stack then is always a kind of snapshot of this. These diagrams are in turn used to create knowledge about software systems. 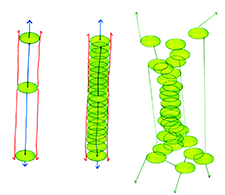 Conversely, the diagrammatic stack is a spatialization of computational processes that allows us to “see” the way that these processes are implemented in a material system, at scales otherwise inaccessible to us. Bringing these two aspects together – the operative and the diagrammatic – is an approach given precedent by many theorists, perhaps most notably Bruno Latour in an essay titled “Visualisation and Cognition: Drawing Things Together.” In it, Latour seeks to construct a methodology that could be used “to define what is specific to our modern scientific culture … to find the most economical explanation of its origins and special characteristics.”29 The approach that Latour develops in response to this goal is focused on the importance of “inscription devices”: the term he gives for various methods of visualizing concepts within a field of knowledge, or what he describes in other terms as “the [ways] in which groups of people argue with one another using paper, signs, prints and diagrams.”30 Incidentally, as an example of this, Latour even cites Dmitry Mendeleev and the periodic table mentioned above, claiming: “Chemistry becomes powerful only when a visual vocabulary is invented that replaces the manipulations [of substances] by calculation of formulas,” only when “all the substances can be written in a homogeneous language where everything is simultaneously presented to the eye.”31 However, Latour is careful not to rely on inscription devices alone as the sole causal mechanism in his investigation (“an exclusive interest in visualization and writing falls short, and can even be counterproductive”) and it is this aspect of his argument that is the most powerful.32 He elaborates: “writing and imaging cannot by themselves explain the changes in our scientific societies … Rather, we should concentrate on those aspects that help in the mustering, the presentation, the increase, the effective alignment or ensuring the fidelity of new allies.”33 In other words, in addition to the importance of diagrams and visualization, it is essential to also consider the entire networks of mechanisms that enable these visualizations to have influence on the world. “No innovation in the way longitude and latitudes are calculated, clocks are built, log books are compiled, copperplates are printed, would make any difference whatsoever” if not for “commercial interests, capitalist spirit, imperialism, thirst for knowledge,” etc.34 Studying the diagrammatic stack without considering its technical counterpart misses the authority lent to the visualization by the strong connection to its material basis, and ignores the technical insights that the diagram provides. Similarly, only studying the operative aspects of the stack in computational machinery ignores the way that this has co-evolved with a mode of visualization and knowledge creation so closely tied to the recursively nested abstraction layers within the machine. The stack then – in both senses – demonstrates the mechanism through which processes and data are captured and enclosed, made into the operable fodder of computational media. In order to show how the stack might function as dispositif, I will establish such a heterogenous set of contexts. If the economy is software, then certainly considering various aspects of how software functions is an excellent way to provide new insights about the function of the economy. Extrapolating aspects from the stack in this domain, we could think for example of the highly abstracted and stratified modes of production and labor in our globalized economy, and the ways that these are oriented along different scales. We might then be able to see how the places and moments where these strata come into contact with each other are controlled interfaces designed to allow flows in highly specified ways. As another example, we can take urban communication infrastructure, as discussed by Shannon Mattern elsewhere in this issue. In this domain we can consider the notion, referenced there, of path dependency, drawing compelling connections between this and the nested levels of temporal and technical precedent of the stack. Doing so reveals similarities between these two concepts and opens up the potential for new insights about the historical and technological processes of development of urban media. Considering the stack as dispositif might provide insights to how this structure influences power and knowledge in an age dominated by software and computational media. The lines between various layers of the stack are often referred to as interfaces. Take for example the top level of an application stack with the user “above”: the top line in this case would be the user interface. Within lower levels, the separation between nested abstraction layers is often called an API, for “application program interface.” An API is a set of commands that a programmer is able to use when implementing a given system (“application”) on top of some lower level – it is the group of facilities provided by a lower level system to a higher level one. What this reveals then is a kind of paradoxical arrangement: so-called higher level systems create a certain indeterminacy in software, opening up possibilities for new types of free creative action; but each of these high-level layers are always already constrained and preconditioned by the lower level systems and infrastructures upon which they are implemented. And so, if it is true that “media determine our situation,”43 then the stack serves as a diagrammatic that illustrates how this is so. If media determine our situation, then still lower level media infrastructures and technological circumstances always determine those media in turn. Returning then finally to the original question – to what extent it is possible and productive to identify and analyze “nondiscursive” or “subsemantic” layers of culture – considering this in light of the stack model provides some new insights. The stack unfolds a given software system into multiple nested layers, and as such, provides fertile ground for where to look for these nondiscursive aspects. For a given software application or medium, we may want to look to lower levels for the nondiscursive structures that determine them: data processing algorithms, physical hardware, or even the way data is represented on a physical machine as binary 1’s and 0’s. However, in light of the stack, it becomes clear how each layer is simultaneously both discursive and nondiscursive. In a way, each layer of the stack serves a nondiscursive role to those above, and yet, a discursive role in relation to those below. As a contrived example, consider the digital image. An analysis that attempts to study the digital image by focusing on underlying technical layers might initially encounter the raw pixel color data that comprise each image and consider the pixel as a kind of nondiscursive atomic unit from which to draw conclusions about the capabilities of the digital image. However, looking down further still, one might encounter the raw binary ones and zeros that comprise each pixel’s data – and from this perspective, that pixel itself, with its reds, greens and blues, would be considered the contained meaning. So while the pixel can be conceptualized as the technical basis for the meaning contained in the image, from a still lower level, the pixel is the meaning contained within the lower level system. Of course, this should not imply that it is not productive to study the image by way of the pixel! The technical affordances of the pixel can reveal much about the way the digital image functions. But a stack-based approach should foreground the pixel’s historical contingency over some sense of technical inevitability, and should inform a praxis that recognizes the possibility of refiguring the pixel in radical new ways. Bauer goes on to state that in articulating the stack structure, he had been strongly influenced by another German computer scientist, Heinz Rutishauer. Bauer cites a paper in which Rutishauer explains a computational process for evaluating arbitrary algebraic expressions – numbers, arithmetic operations and parentheses. Rutishauer describes this process as generating a “Klammergebirge,” which roughly translates to “parenthesis mountain range” – and it is precisely this “mountain range” that we still see today, for example as illustrated in figure 3 above.46 Seeing the stack as a historically contingent object serves to remind us that it was created within a discursive framework, and allows us to imagine other alternatives, and to consider the different models of computation that those might enable. The stack is a fundamental structure of computational media, but it is also an arbitrary structure and a cultural object. Recognizing this, we might imagine other fundamental models of computational media. A second concern with this method of analysis is that a stack-based approach could be seen as possessing a bias toward a teleological perspective: as if to imply that the media technology systems of our present circumstance are the natural or inevitable result of some purposeful procession of technological progress. There are many critiques to such a way of thinking, perhaps most notably from Sigfried Zielinski, who in the aforementioned text advocates for his “anarchaeological” approach to media archaeology. He writes that “the notion of continuous progress from lower to higher, from simple to complex, must be abandoned, together with all the images, metaphors, and iconography that have been – and still are – used to describe progress.”47 While it is true that the stack can serve to illustrate processes of development from low to high, it is important to keep in mind that what it shows is always one particular configuration, not a historically necessary pathway – in effect, a kind of arbitrary teleology, if such a term makes sense. In fact, by unfolding the various nested layers of abstraction within a technical system, an archaeology of the stack can readily point to insights critical of technological progress. For example, in the 1990s, Sun Microsystems introduced Java, advertised to technologists as a “write once, run anywhere” programming language.48 The promise was that Sun had developed a technology that would free programmers from concerns about idiosyncratic differences between various hardware systems – instead of rewriting code to account for subtle differences between the APIs of different low level systems, a programmer could write one standardized Java code that would run on all hardware systems. The way this worked in practice was that Sun developed a “virtual machine” and implemented versions of this above the actual physical machine for various hardware platforms. This functioned as a new layer of the stack upon which programmers were to create applications. An analysis of the stack in this example highlights how its technological development was a typical market-driven process of standardization: an attempt to eliminate eccentricity and variance in support of a commercial business interest. Despite the potential conceptual pitfalls, a stack-oriented approach to the study of software remains a valuable one, if for no other reason than that stack structures exist empirically within present software systems at a fundamental level – they are a ubiquitous data structure and a mode by which recursive function calls are implemented. Beyond the purely empirical level, it is productive to identify and consider the various ways that the stack is expressed through higher level systems, affecting how software-based systems and other dependent media are organized and conceptualized as well other related domains such as infrastructure and economics. In one sense, the argument outlined above could be understood as positioning a stack-based analysis in opposition to the materialist approach of German media theory. By inducing a mode of thinking always readily able to see another lower level, the stack might imply that the “nondiscursive” or “subsemantic” layers that the materialist impulse seeks simply do not truly exist. However, my analysis here reveals how the stack is actually complementary and beneficial to the materialist approach. By highlighting the interfaces between layers of media systems and the existence of lower level technological dependencies, the stack provides a methodology that instructs where to search for such non-human technical substrates, while also challenging materialist approaches to always consider such layers as operating in relation to the human, cultural sphere. Indeed, by drawing out a stratigraphy of abstraction – by unfolding the various strata of nested abstraction layers that comprise software and other media systems – and by pointing us toward lower level systems and “hidden programs of media,” while simultaneously challenging the impulse to naturalize or essentialize these lower levels, the stack is an invaluable tool of network archaeology.